The release of the Vector marked as a change in OCZ's strategy. With a new CEO, OCZ's goal was to change the company's brand image from being a low-cost value brand to a higher-end, high performance and quality SSD manufacturer. For the first time, OCZ decided not to release a value version (Agility-level drive) of its Barefoot 3 platform and only focused on the higher-end market with the Vector and Vertex 4xx lineups. Almost two years later since the introduction of the Vector, OCZ is now finally comfortable with bringing the Barefoot 3 platform to the mainstream market and the ARC 100 acts as the comeback vehicle. Similar to Vector 150 and Vertex 460, one of the main focuses in the ARC 100 is performance consistency and OCZ remains to be one of the only manufacturers that reports steady-state performance for client drives. The biggest difference to Vector 150 and Vertex 460 is in the NAND department as the ARC 100 utilizes Toshiba's second generation 19nm NAND, i.e. A19nm as Toshiba calls it. Despite the smaller process node NAND OCZ is rating the ARC 100 at the same 20GB of writes per day for three years as the Vertex 460, although the ARC 100 is slightly slower in performance and also drops bundled cloning software and 3.5" adapter. 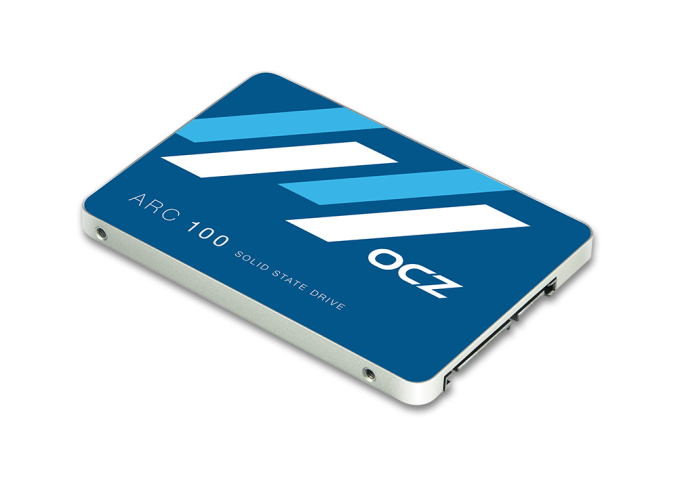 Given the smaller cell size of the A19nm NAND, OCZ is able to price the ARC 100 more aggressively. At higher capacities OCZ is able to hit the $0.50/GB mark and the ARC 100 is actually very price competitive with Crucial's MX100, which has been our favorite mainstream SSDs for the past couple of months. I am getting back from the US tomorrow and my review samples are already waiting for me at home, so you should expect to see the full review next week! Why compare one product's MSRP to another's street/sale price? Nobody here is going to buy one of these drives at 50 cents/GB, because nobody here is going to buy a SSD from the likes of a mainstream retail chain. On websites that cater to bulk cheap nerd sales these will sell for substantially less, and the price will of course drop over time as well.